Asaf “Asi” Cymbal, who has sold parcels in Miami’s Design District for a $9 million profit and purchased a prominent site in downtown Fort Lauderdale for a dream project, is prouder of his mom than his own accomplishments. Her one-off investments in apartments in the 1980s, by pooling together savings and a few thousand dollars from family and friends, allowed the single mother to ultimately buy several units and a 64-unit apartment building near Brooklyn’s Coney Island, which helped lift the family out of poverty. That investment ethic and will to rise above led the family out of Coney Island’s Trump Village affordable housing project, built by Donald Trump’s father, to the middle-class Sheepshead Bay neighborhood in 1987, when Cymbal was 17. “She taught me that my way out was to buy and sell apartments here or there, to create income – and I could do this as a career,” said Cymbal, 42, owner of Miami-based Cymbal Development. Cymbal got his foot in the door of development in 1992, while he was a law student at the University of California, Los Angeles. His mentor was developer, general contractor and Santa Monica mixed-use pioneer Howard Jacobs, whom he met through one of his professors. Jacobs, the developer of hundreds of apartments, hired Cymbal in 1997 at about $20,000 a year to draft performance analysis for projects. Cymbal learned how Jacobs did everything from locating land to developing buildings, which allowed for a high level of quality control. He also looked outside the model of just buying and selling property to building the properties he owned, which promised to generate more money. Wanting to return to New York, Cymbal moved back in 1999 with no job in hand. He was unemployed for a year before meeting real estate attorney Noel Dennis, a solo practitioner who managed transactions and litigated in court. While Cymbal loved litigation, he was still looking for a job in development. After three years with Dennis, he answered a classified ad requesting resumes from real estate professionals. Within a week, he was interviewing with Shaya Boymelgreen, who had just signed a partnership with diamond magnate Lev Leviev and his company Africa Israel to develop mixed-use projects in Manhattan. Cymbal was brought on as VP of the company, which executed several prominent projects, including converting the former JPMorgan headquarters into the Downtown by Philippe Starck luxury condominium. He was with the company from 2002 to 2004, as both project manager and general counsel. Leviev Boymelgreen proposed several projects in Miami, the bulk of which never came to pass, and Cymbal’s involvement in the company was limited to New York. He relocated to Miami in 2004 with a desire to make his own mark in Miami’s Wynwood neighborhood, an area that was a blank slate. People who know him say his focused, patient determination and his long-view approach to turning nuanced, multifaceted plans into reality was ideally suited to the neighborhood, which had a very raw identity. 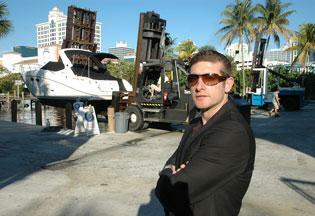 Drawing on friends, family and new business relationships for support and funds, Cymbal Development has acquired, developed or constructed more than $150 million in projects in Miami, including the ground-up development of 25,000 square feet of offices and retail on Midtown Miami’s west side, which houses popular restaurant Gigi and music venue Bardot. He is also part-owner with hospitality maven Amir Ben Zion and chef Michelle Bernstein of two more restaurants in the Design District: bakery/café Crumb on Parchment and Sra. Martinez, a two-story tapas restaurant housed in a stately building that once served as the neighborhood’s post office. In February, he sold more than a half-block of contiguous parcels in the Design District for a combined $11 million to Dacra President Craig Robins, who is planning a high-end, luxury retail mall in the neighborhood. Cymbal paid $2 million for the $10.5 million note in 2009. Today, several investors, including New York’s Moishe Mana, are leveraging real estate in Wynwood, seeking to convert warehouses, and second- and third-tier retail stores into restaurants, coffee shops, galleries and arts venues. Tony Cho, owner of Miami’s Metro 1 Properties, said entrepreneurs like Cymbal helped grow the area’s burgeoning retail and arts infrastructure. Cymbal was recently in the spotlight for his boldest move yet: buying the 6-acre Cabi New River site out of bankruptcy for $11.5 million. The site includes the Pirate’s Republic Restaurant, formerly known as Shirttail Charlie’s. The neighborhood has already started a transformation, with new townhomes and a high-rise residential project. “We want to create a community and give it life and soul,” Cymbal said. Jeff Morr, owner of residential and commercial brokerage Majestic Properties, said Fort Lauderdale’s real estate market has not recovered as quickly as Miami, but the potential for growth there is big. He said Cymbal has the skill set that could create a very successful project. “Those people who build with cash today will make a lot of money in a few years when it’s done,” Morr said.